Jamaica Village, Queens Co. L.I. A scarce example of Fredrick W. Beers' map of the town of Jamaica Village, Queens, New York. Published in 1873. Covers roughly from modern day Highland Avenue to Atlantic Avenue, and from Myrtle Avenue to Franklin Avenue. Detailed to the level of individual buildings and properties with land owners noted. 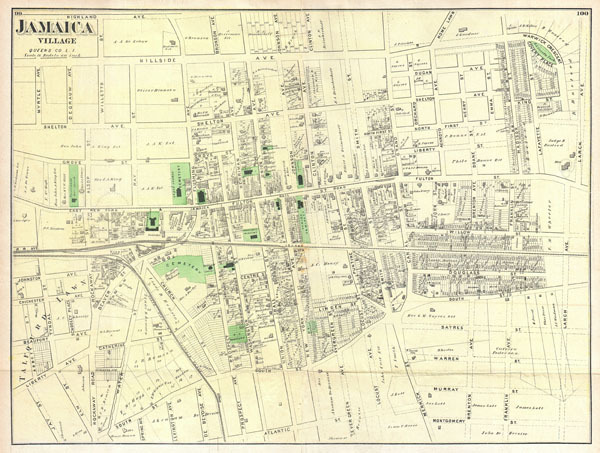 This is probably the finest atlas map of the town of Jamaica Queens, to appear in the 19th century. Prepared by Beers, Comstock & Cline out of their office at 36 Vesey Street, New York City, for inclusion in the first published atlas of Long Island, the 1873 issue of Atlas of Long Island, New York. The Beers family (Fredrick, Silas, James and Daniel) (fl. c. 1850 - 1886), along with Charles and Augustus Warner, were prominent map publishers working from the 1850s to the late 1880s. Often publishing under the Warner & Beers designation, the combined firms produced a series of important state and county atlases and map of much of the northeastern United States. Many of their regional maps are among the most detailed and well laid out maps ever produced of their respective regions. Because Warner & Beers county maps were often detailed down to the individual homes and landowners, they have become highly sought after by general and family historians. In additional to producing maps of surpassing detail, Warner & Beers also maintained an earlier generation's attention to detail and quality while publishing in an era ever increasingly dominated by the low cost printing methods used by the publishing empires of Rand McNally and George Cram. Atlas of Long Island, New York. From Recent Actual Surveys and Records Under the Superintendence of F. W. Beers. (1873 First Edition). Very good condition. Original folds. Blank on verso. New York Public Library, Map Division, 1527299.